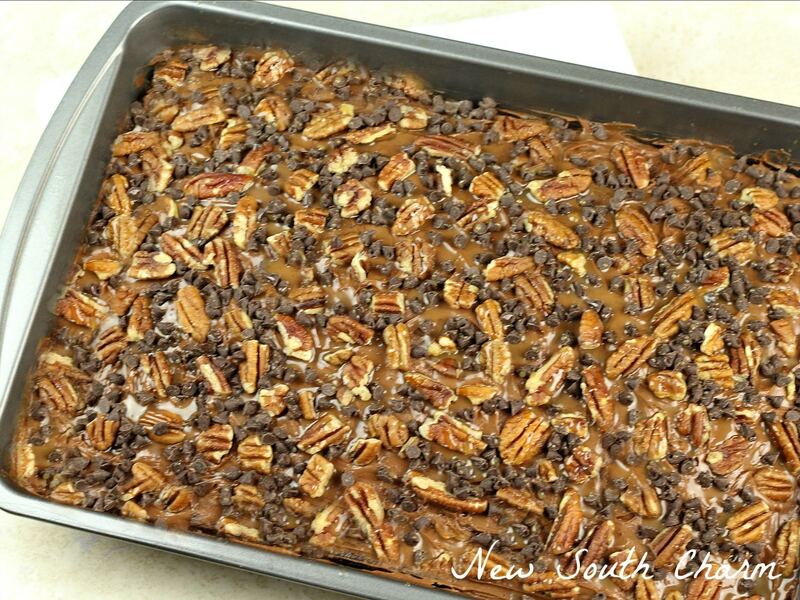 If you like Turtle Candy you will love this easy to make recipe for Chocolate Turtle Poke Cake. 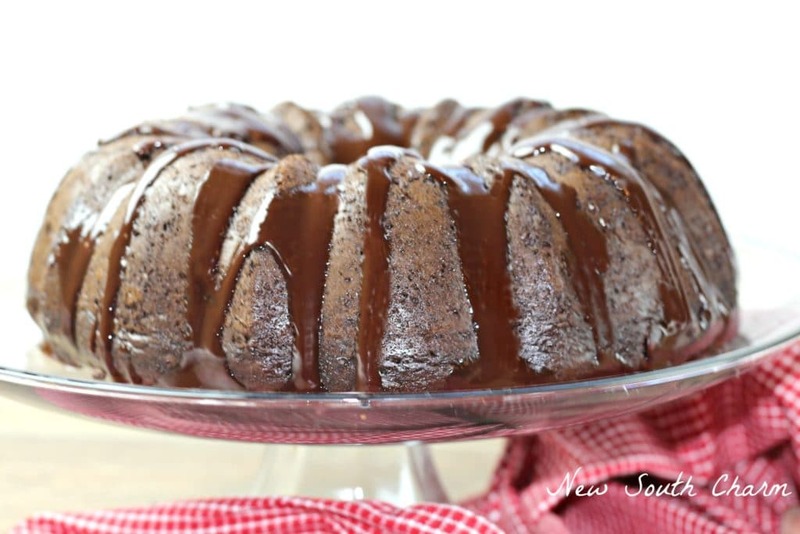 This cake has all the great flavors of the popular candy but in a chocolate cake!! Let’s talk about baking. I’m not very good at it. But lately I’ve been spreading my wings and trying some new recipes. 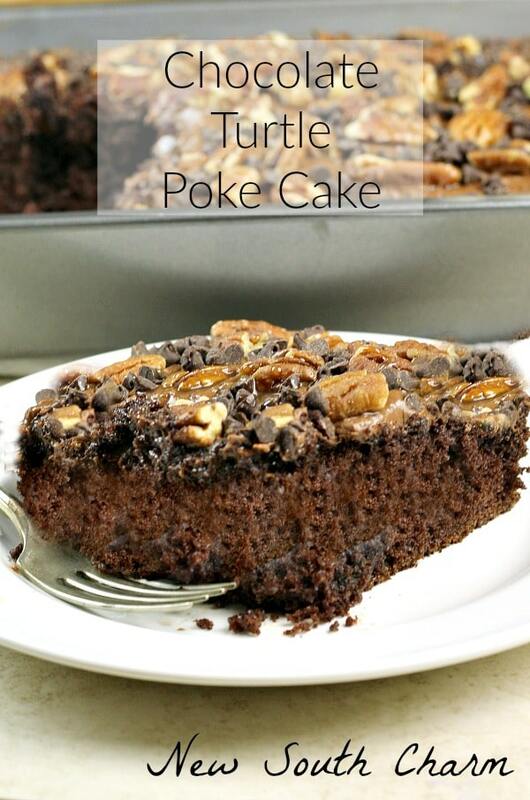 This Turtle Poke Cake is one of those recipes and trust me it was totally worth trying. 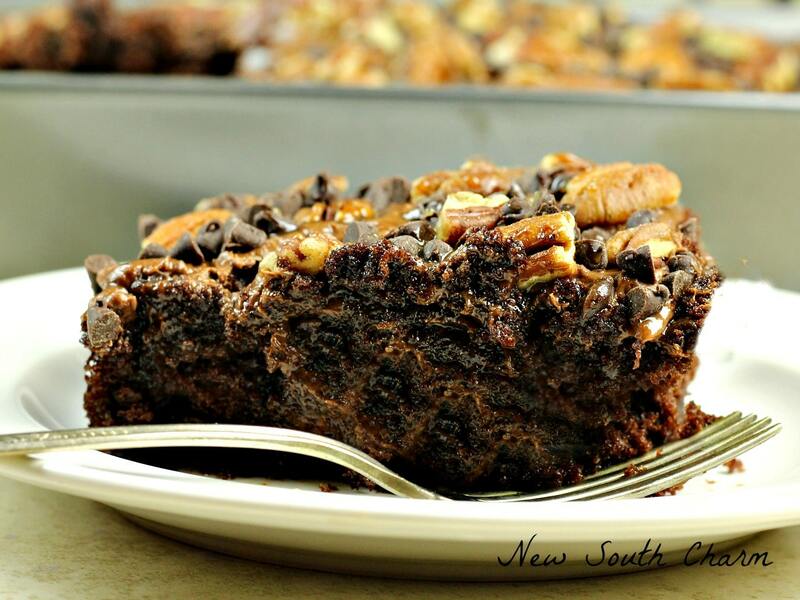 This Chocolate Turtle Poke Cake has received rave reviews from family and friends. It’s sweet with a touch of salty, my favorite combination. Plus, I was surprised with how easy it was to make. As I mentioned before baking is not something I do very often. When I do bake it has to be something I can really see myself making. I also prefer semi-homemade recipes like this one for Chocolate Turtle Poke Cake because let’s face it they are easier. Start by mixing up a boxed chocolate cake mix. Then bake following the directions. When the cake if done let it cool for about ten minutes. Once the cake is cooled poke holes in the cake with the handle of a wooden spoon. Next pour a cup of caramel syrup over the cake. Then spread the caramel out with a knife or rubber spatula to make sure it gets in all the holes. Put the cake in the refrigerator for an hour to all the syrup to absorb into the cake. After an hour frost the cake with chocolate frosting then sprinkle the top with pecans and chocolate chips.Then to really put the cake over the top drizzle on more caramel syrup. Slice and enjoy. Store leftover cake, if there is any, in the refrigerator for up to five days. 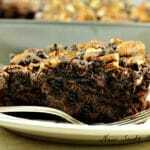 If you like Turtle Candy you will love this easy to make recipe for Chocolate Turtle Poke Cake. Bake cake according to package directions. Remove from oven and allow to cool for about 10 minutes. 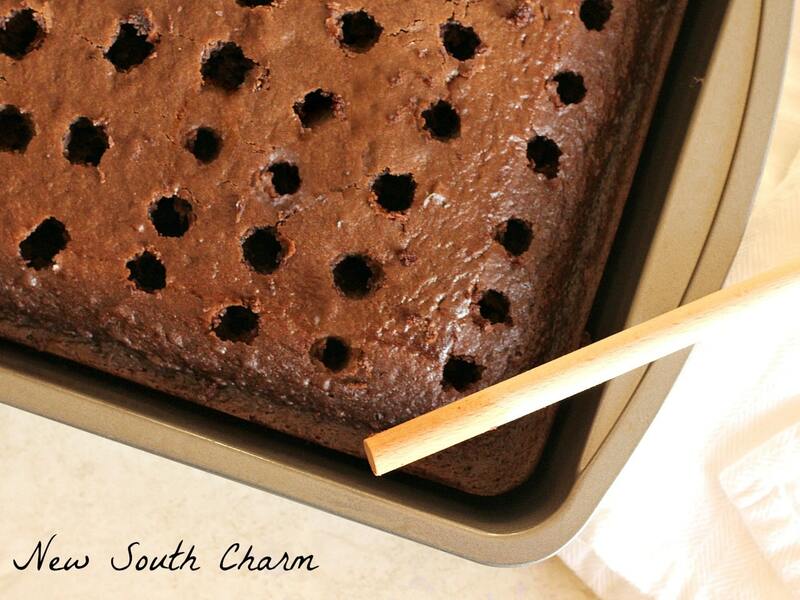 When cake is cooled poke holes in the top of the cake with the handle of a wooden spoon. Pour one cup of caramel syrup over the top of the cake. Spread the caramel out with a knife or rubber spatula to make sure it gets in all the holes. Put cake in the refrigerator for an hour so the syrup can absorb into the cake. Frost cake with chocolate frosting then sprinkle pecans and chocolate chips over the top. Drizzle on more syrup. 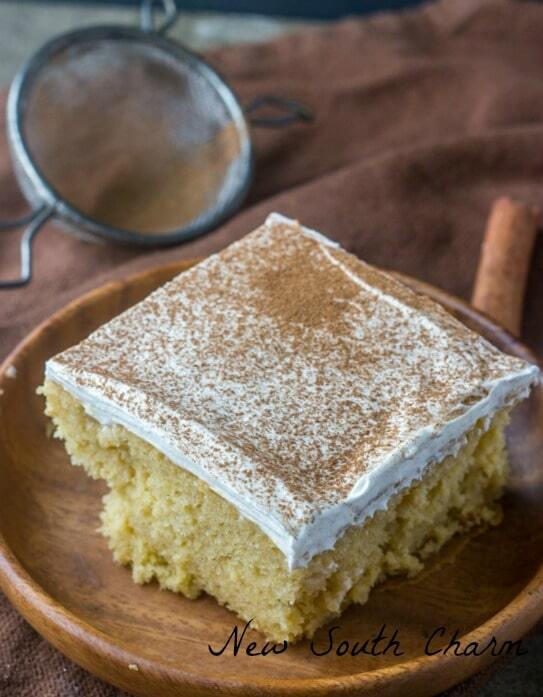 Looking for more EASY DESSERTS and POKE CAKES? Susanne, I am pretty sure this cake would become one of my favorites. I love the combination of nuts, chocolate and caramel. When I buy a candy bar, I usually head for the Turtles candy. Love them and would love this cake. I love poke cakes! But his is a new one for me. I know that I would absolutely love a slice or two. I love everything about chocolate, caramel, and pecans. I may or may not have devoured this slice right after taking the picture. I love chocolate caramel and pecans too! Semi-homemade are my favorite kind of recipes. Oh, and I adore chocolate and caramel, so I know i”ll love this poke cake. If it’s easy to make I’m on board and this cake couldn’t have been easier to make. It was fantastic! I adore anything with chocolate, caramel and nuts. 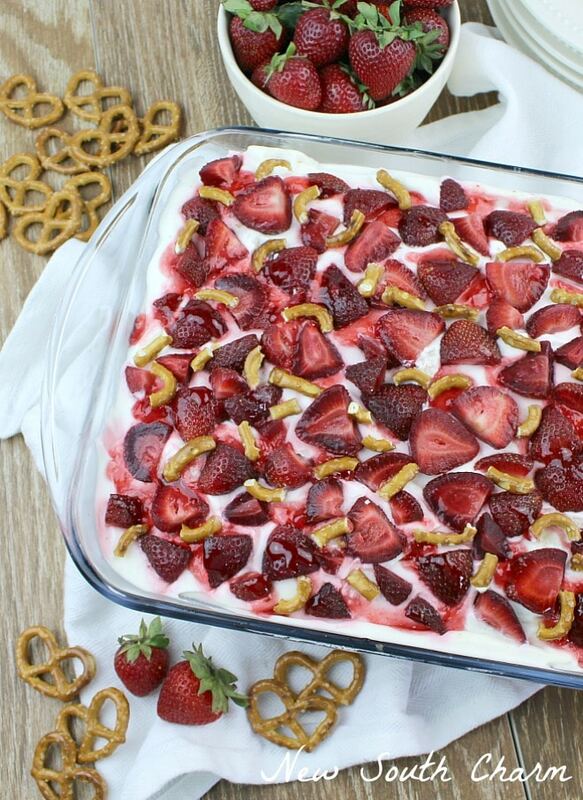 I’ll be making this soon!!!! YUM OH YUM! I would definitely swoon over all these flavors. Thanks for sharing with us at Weekend Potluck. I am going to fix this cake for Thanksgiving dessert. Absolutely love anything with chocolate and the caramel and pecans just make it even more tantalizing! Thanks for sharing! Poke cakes are the best! This one looks amazing! Thanks for sharing!! I love Carmel and chocolate.